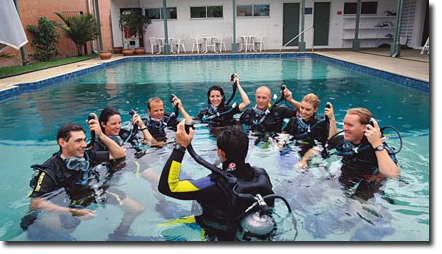 The Open Water Diving Course Cairns is sanctioned by PADI and is conducted at the Cairns PADI diver training centre. Cairns Dive Centre staff are all dedicated, long serving experts with great communication skills developed through years of interaction with and training of diving students and hundreds of dives on Australia's Great Barrier Reef. Take the plunge and learn to dive on our 4 day PADI E-Learning Open Water course. Day 1 and 2 are spent at the customised Cairns Diver training centre learning the theory and underwater diving skills and techniques. Days 3 and 4 are spent on one of TUSA Dives fast and modern day boats where you'll complete the 4 training dives required for your PADI Open Water certification. You'll return to your accommodation in Cairns each evening. On completion of your training dives their is time for 2 guided dives as a certified diver on the Great Barrier Reef. NOTE - You will have a different dive instructor for the 2 days of diving on the boat from the one you had in the pool. Courses commence Tuesday, Thursday and Saturday and only instruction in English is available. You can look forward to seeing an array of marine life such as turtles, sharks and manta rays. Important Information For Learn to Dive Course Participants continuing on with their dive education. Prior to commencing your Learn to Dive Course you are required to complete the self-assessmentEntry Level Student Dive Medical Declaration. A positive response to any question means that there is a pre-existing condition that may affect your safety while diving and you must consult a medical practitioner preferably with experience in diving medicine to obtain a dive medical certificate that states that you are fit to undertake recreational diver training. To avoid disappointment we suggest that you complete the Student Diver Medical Declaration and if necessary obtain a dive medical from a doctor prior to commencement. (Any costs associated in this process are payable direct to the doctor). Important Note:Student Diver Medical Declaration and Dive Medical (if required) must be completed within 90 days of commencement of your learn to dive course. Camera Hire:Digital underwater camera's are available for hire on board our dive boats for a cost of A$40 per dive. You can cancel your Learn to Dive course for any reason at any time up to the end of Day 1 of the course and only incur a $25 cancellation fee. There is no refund for any reason after this time. 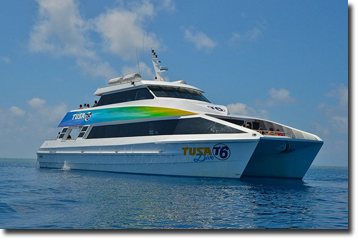 Extra Charges: An additional fee of $20.00 per person is payable direct to Tusa Dive. This fee consists of $7.00 Government Environmental Management Charge, Port Departure tax and administration charges. City and Northern Beaches for Days 3 & 4 additional charges apply for accommodation transfers - $12 City and $17 Northern Beaches.